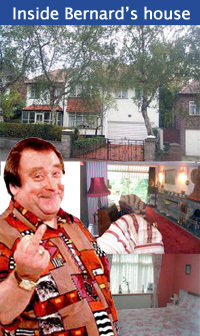 Bernard Manning’s Manchester house has gone on sale for £450,000. One visitor to the four-bedroomed house in the Alkington district admitted it was ‘dated and in need of modernisation’ – and there is plenty of evidence of smoking. Manning bought the house for his mother in the Seventies and moved in with her when his wife died in 1986. The Thirties house has appeared on TV several times, as Manning would be interviewed on the sofa wearing only his underwear. That includes bright pink bathrooms complete with bidet, fishtanks built into the stone fireplace and formica kitchen units. Above the front door is a sign with the Jewish greeting ‘Shalom’ – which Manning, who died in June at the age of 76, used to cite as an indication of his tolerance of other cultures. The house is on sale through estate agents Michael Andrews.